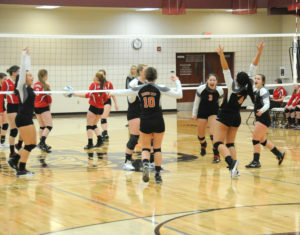 In a blitz of volleyball action, as of Friday morning all three county volleyball teams are alive in the playoffs. 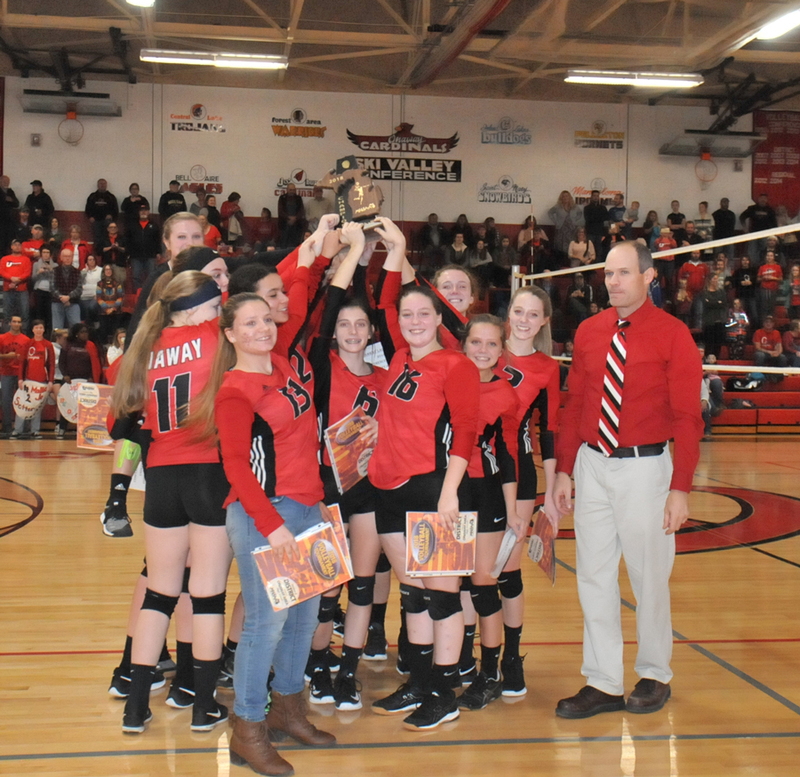 Onaway is already district champion for the first time since 2014 while Posen and Rogers City each play in the district championships today (Nov. 2) in different locations. Posen takes on Hillman at 5 p.m. today in Atlanta in a Division 4 district. The Vikings defeated Atlanta 3-0 while Hillman topped Gaylord St. Mary 3-1. The winner of that district takes on the winner of the Leland vs. Traverse City Christian game. That regional will be played in Bellaire. The Huron players celebrated the winning point in Thursday’s semifinal match with Johannesburg-Lewiston. Taylor Fleming led the team with 18 kills, 28 digs, three aces and two blocks. Kyrsten Altman had 20 digs, six kills and three aces while Kristin Brege had 33 set assists. The Hurons have won three straight Division 4 district and regional titles, but now are playing in Division 3. 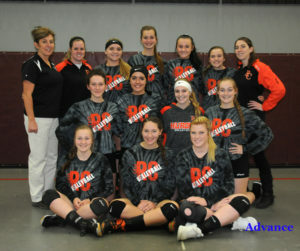 The Hurons, under coach Jackie Quaine, made the Division 4 final-four the last two seasons. The winner of the Charlevoix district plays the winner of the Suttons Bay vs. Traverse City St. Francis match. The MHSAA Web site had, as late as last evening, shown that the winner of the Charlevoix district would play in Marquette against an Upper Penisula winner. Upon checking the site this morning (Nov. 2) the site now shows that Calumet will take on Manistique in Marquette Tuesday in one half of the regional semifinals. The Charlevoix district winner will take on the Traverse City winner in Gaylord Tuesday at 5 p.m. It is unclear whether the MHSAA changed the match-up to make travel easier or if the incorrect information was posted previously. Regardless, it means less travel time for players, fans and press. The regional championship remains scheduled for Thursday, Nov. 8 at Manistique. 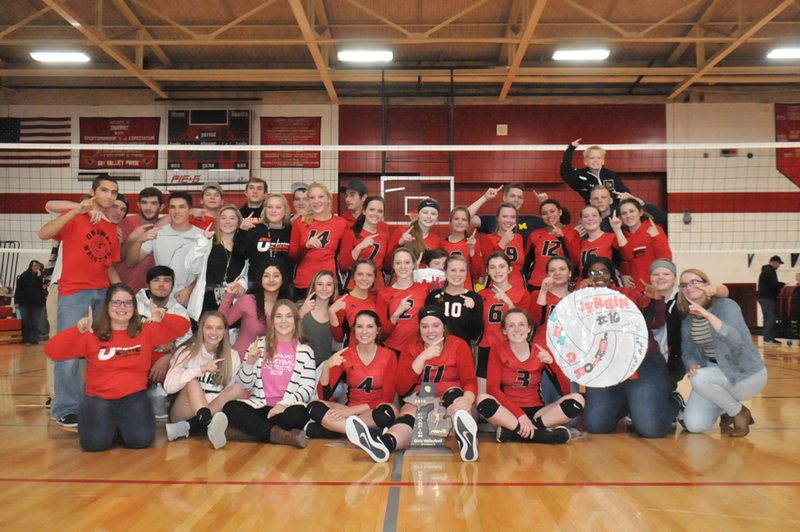 With a sweep of Burt Lake Northern Michigan Christian Academy (BLNMCA) 25-9, 25-20 and 25-8 the Onaway Cardinals’ varsity volleyball team captured its first district title since 2014. Onaway now moves on to the regional tournament in Mackinaw City. Onaway will play Pickford at 7 p.m. Tuesday, Nov. 6. 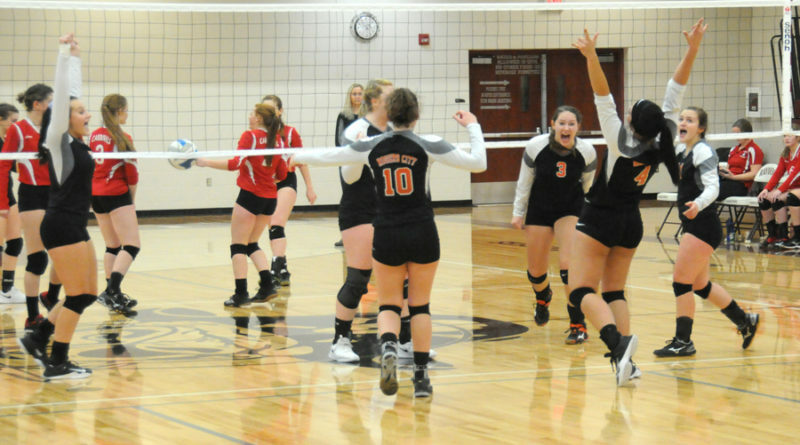 Pellston and Rudyard will play in the other regional semifinal match at 5:30 p.m. Tuesday. The finals are scheduled for 6 p.m. Thursday, Nov. 8. On another night where coach Steve Watson was able to get every girl in his lineup time on the floor, the Cardinals’ took care of business. “They weren’t pushed in this district so we talked about trying to enjoy the experience of playing a district at home, winning a district at home. Years from now they aren’t going to probably remember too much about the game but they will remember their experience of playing their last home game in a district final, winning it. I hope the seniors remember the crowd supporting them when they came off the floor,” said coach Watson. Watson took his three seniors out, one by one near the end of the third and final set, knowing the match was in hand. Senior Calley Selke led the hitting attack with six kills while adding two aces. Senior Kennedy Crawford added four kills. Sophomore Breya Domke had four kills, two aces and three digs. Junior setter Mallorie Neelis had three kills, 17 assists, six aces and eight digs. Junior Mattey Hoerner had three kills and four digs. Junior Jackie Sellke added seven digs and freshman Taylor Larson had eight digs. Junior Malashia Van added three kills and six digs. a perfect 9-0 in district play with steady play. The Cardinals are now 32-17 overall and ranked as honorable mention in Division 4. 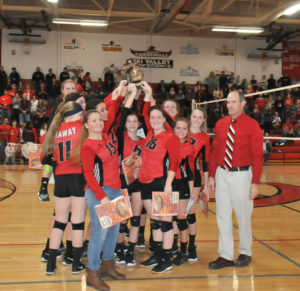 Onaway has won its home tournament trophy, the Ski Valley Conference title, the Presque Isle County Championship trophy and a now a district trophy. “I never get tired of winning. I think that would be a successful season by a lot of peoples standards and it definitely is but we’ve got work to do,” said coach Watson. Coach Watson is hopeful the crowd that supported his team at the district tournament, cheering them on, will follow them the Mackinaw City and pack the gym. “Last time we were in a regional some of these kids were pretty young. 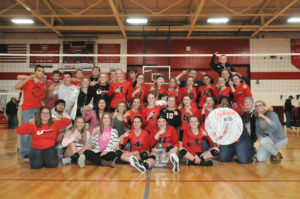 I always want the crowd to get louder and louder and louder, it helps prepare us for the big games,” said coach Watson.